For today's Sunshine's Stamps card, I chose to use Romeo again. However, there is something missing from good ol' Romeo...his extended heart. (scroll back a few cards to see what he looks like normally) I wanted to show you all the versatility of using a digi image. Hopefully this doesn't get me in any trouble with Sunshine :) I was looking to make an Easter card and just LOVE Romeo....but his 'heart' just wasn't working for Easter.I opened him up in Paint Shop Pro and simply 'erased' his heart, added a few lines and boom....an altered image :) This is one of the main reasons I just love working with digi images. The same thing was done to "Huckleberry" on Stephanie's Blog.....Hucks heart was removed and an Easter egg was put in it's place. THIS is Huck with the heart...and THIS is him with the egg. Yep, I LOVE digi images :) If you get a chance, click on her link and check out her images! I actually didn't use any Copics on this image....it's all Prisma pencils!! It's hard to really see it, but I also used white fun flock on his tummy, snout and ears. 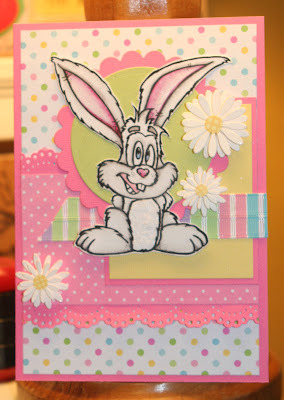 Such a pretty, spring-like card! Love it!!! You talented thing, you! awwww! THANKS FOR THE HONORABLE MENTION! LOVE this one... You know! Love that you got rid of the heart to use him for easter, I was thinking he'd be an AWESOME image to use for easter......Love the fun flock and the word snout... I would have called it a beak, but...lol Maybe I can put some fun flock on Petie to make up for his lacking hairs.... lol Love it gurl, awesome job (as always! How adorable! You used some really great DP for a awesome card. So precious! The colors are so soft! The layout is wonderful! Fabulous job with Romeo!